Where food is limited, sea otters pursue a diverse array of feeding strategies. Photo by Chris Brown, USGS. Ecologists have long observed that when food becomes scarce, animal populations exploit a wider range of food sources. So scientists studying southern sea otters at different sites in California's coastal waters were not surprised to find that the dietary diversity of the population is higher where food is limited. But this diversity was not reflected in the diets of individual sea otters, which instead showed dietary specialization in response to limited food. The new findings by researchers at the University of California, Santa Cruz, will be published in the Proceedings of the National Academy of Sciences (online January 14 and in a later print issue). The study found that all sea otters in an area with abundant food resources share the same dietary preferences. 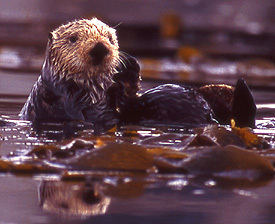 Where food is limited, however, a diverse array of feeding strategies emerges, with individual sea otters specializing in particular types of prey. Tim Tinker, a UCSC research biologist and first author of the paper, said the study has both theoretical implications for the science of ecology and practical implications for wildlife management. "The traditional way of viewing the relationships between predators and prey and how food webs are structured may be oversimplified," Tinker said. "When you look at the population as a whole, you may see a diversification of the diet in response to limited food resources. But when you look at individuals, you see dietary specialization." One implication of this dietary specialization for California sea otters is that some otters may be exposed to certain food-borne pathogens much more frequently than otters with different diets. "A lot of sea otters in the Central Coast population are dying from infectious diseases, and this could help us to better understand that disease mortality by allowing us to pinpoint the specific vectors of disease transmission," Tinker said. Tinker's coauthors on the paper are Gena Bentall, who worked on the study as a UCSC graduate student and is now with the Monterey Bay Aquarium's sea otter research and conservation group; and James Estes, an adjunct professor of ecology and evolutionary biology at UCSC and a wildlife ecologist with the U.S. Geological Survey. The study compared sea otters on the Central Coast, which has the largest population of southern sea otters, to those in a much smaller population around San Nicolas Island off the coast of Southern California. The San Nicolas population is the result of an effort by the U.S. Fish and Wildlife Service to reduce the vulnerability of California sea otters to oil spills by establishing a separate population from the main one on the Central Coast. In the late 1980s, about 140 sea otters were relocated to San Nicolas Island. Most of them soon returned to the mainland, but the few that remained have prospered. With plenty of food to go around, the San Nicolas otters are in better shape than their mainland counterparts, and their population is now growing much faster than the Central Coast population. "The San Nicolas otters are much bigger than the mainland animals, their body condition is better, and they spend less time feeding," Tinker said. "When we looked at individual diets, a few key prey types dominated, and each otter's diet looked pretty much like every other otter's diet." The otters' preferred prey are the large, energy-rich red sea urchins, which are abundant around San Nicolas Island. On the Central Coast, red sea urchins are much less common than the smaller purple sea urchins. The San Nicolas otters also eat marine snails and crabs, but there is little difference between the population as a whole and individual otters in terms of dietary diversity. Each otter is a generalist, with the same preferences as other otters. The mainland population is dramatically different. While the diet of the population as a whole is much more diversified than at San Nicolas, individual diets are more specialized. Estes said it is not surprising that animals are highly individual in the way they feed, but the link between individual specialization and resource availability is new. "What's new in this paper is that individuality is a plastic characteristic that emerges when resources become limited," Estes said. "We're seeing this in sea otters, but it probably occurs broadly in nature. It may apply to people, too. When there were just a few people running around on the face of the Earth, they were probably all doing pretty much the same thing." Individuality in feeding behavior adds a new level of complexity to the dynamics of food webs. For wildlife managers, it means that each animal has to be considered as an individual and may not be representative of the whole population. But the findings also suggest a potentially useful tool for assessing the status of wildlife populations, Estes said. "It's very hard to know where a population stands with respect to resource limitation; we're always asking if a population is limited by the availability of food," he said. "We could conceivably look for individuality in foraging behavior as an indication that food limitation is an important factor." According to Estes, scientists were already convinced before this study was completed that the availability of food is limiting the Central Coast sea otter population. He said the same situation probably prevailed throughout California before fur traders began hunting sea otters in the 18th century, eventually driving them to the brink of extinction. But it is not clear why sea otters are not spreading out into other areas along the California coast where they would find more food than on the Central Coast. "Why this population does not expand into food rich areas is one of the perplexing challenges we have not been able to figure out," Estes said. Note to reporters: You may contact Tinker at (831) 459-2357 or tinker@biology.ucsc.edu and Estes at (831) 459-2820 or jestes@ucsc.edu.